You are here: Home / Food Matters / Bone Broths / Bone Broth Marathon: Where Do I Get The Bones For Bone Broth? Yesterday we issued a Winter Real Food Challenge to consume bone broth daily until Valentine’s Day. Take the pledge and be entered to win a free Menu Mailer and Recipe Archive subscription. Over the next few weeks, we’re going to go over a lot of details on how to make stock and multiple recipes using stock, tips and other ideas to add more stock to your diet and get it into your kids. Today I’m consuming homemade beef stock in potato soup for lunch. Only purchase whole chickens that you cut up yourself. Use the backs and wing tips for making stock any time you use chicken for a recipe that requires parts instead of a whole chicken. If your recipe calls for boneless meat, buy it bone-in and cit it yourself. This will often save you money and also give you bones for stock. Save the bones from making chicken dishes and use those bones to make stock. 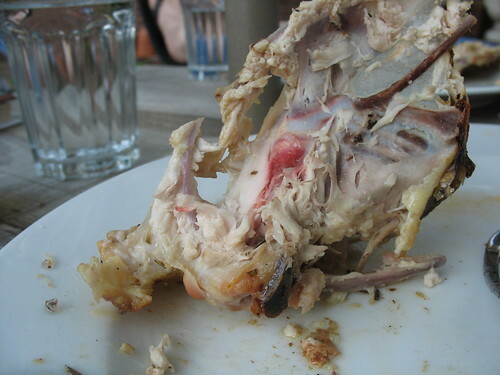 If your dish had any sauces or breading, scrape/rinse off the bones before proceeding. Talk to the butcher at your local Health Food Store. I purchase chicken backs from my local store when I need more stock than I can make from saving bones. They normally grind those backs to make raw dog food available to customers. Contact all of the grass-fed beef farmers in your area and offer to pay them a nominal fee for any bones and feet (and organs!) not claimed when a client picks up their side of beef/lamb/whatever. I personally obtain most of my bones for beef broth this way. Contact the local butcher your farmer takes his animals to and find out if you could get bones from him or make some form of an arrangement. If you’re really having to stretch the bones you get (or even if you aren’t), use the chicken bones to make stock until they disintegrate, adding fresh chicken feet each time. Amanda Rose from Traditional Foods did a YouTube video showing how she got 12 days of gelatinous broth from one set of bones with a beef foot in her crock-pot. Check it out. If you have no local resources at all, US Wellness sells the bones online. If you have an abundance of bones, I would encourage you to gently cook your stock down to concentrate the goodness in it so you get more nutrition into yourself each time. This is especially important for kids, who need all of the concentrated nutrition they can get. Where do you get your bones? Do you have any unique sources? How did you consume your one cup on bone broth today? KerryAnn, I was really needing this post, thank you. I’ve been recently ruminating on what a hard time I have generating enough bones to have stock on hand as often as we can eat it! I ask for doggy bones at the butcher and grocery store. They will usually give me 1-2 beef bones for free. Sometimes I buy oxtail at the grocery store. These aren’t bones from grass fed animals, but until we can purchase a meat share, I think making homemade bone broth from conventional sources is better than canned broth! Thanks KerryAnn for this post! I have been struggling to find bones, but mostly because I don’t know where to look. I get some beef bones from the place that I get my beef twice a year, but chicken bones are harder for me to find. I buy whole chickens whenever my health food store has them on sale, but that’s not often. I’m going to be a little more diligent about tracking them down. On the plus side, I have a big bag of chicken feet in the freezer from my parent’s last chicken harvest. Question: How many chicken feet would you put in a batch of stock, say a 6-qt pot? Jessica, I normally use 1-2 feet per gallon of water. Really, you just adjust it to your taste preference. Some people don’t like their stock as rich as others do. Check with your health food store to see if they have chicken backs, too. That’s how I get mine.